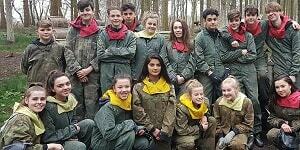 Paintball Direct is a great choice for school paintball trips, what day out could be more exciting than paintballing? We offer regular paintball from 9 years up, and we also offer kids' low-impact miniball paintball for ages 8 years up. We have run beginning of term and end of year paintball trips for dozens of schools, the same schools returning year after year. As long as you have a group of 16 or more, you can have your own game seperate to our other visitors, perfect for school house paintball competitions or groups with behavioural problems. If you have any special needs requests then please contact us to discuss these, with a few adjustments to how we normally operate we have hosted days out for deaf children and those with learning difficulties. We understand that when organising a school trip there are many factors to be considered, but number one is always safety. Safety is our paramount concern too, which is why you can trust your pupils with us. We have full liability insurance, staff trained in the safe-guarding of children, and always have first-aid trained staff on site. Our equipment is regularly checked and we maintain a minimum staff:vistors ratio to ensure your event is well supervised. Don't hesitate to contact us for copies of our insurance certificate and risk assessment. We also know that with ever tightening school budgets price matters too, so we have discounted prices for kids' paintball, and are confident you won't see these prices matched elsewhere. Our school paintball packages are designed to be as clear as possible with NO hidden extras, so you know exactly what it will cost when you book. Have a look at our school and youth group paintball prices shown below, but if you require a bespoke package then please do not hesitate to contact us. 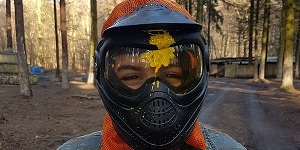 We will also fill your groups' gun hoppers with their paintballs throughout the day, guaranteeing they won't run out of paintballs before the end. A Domino's pizza can be added as a lunch option, or to keep costs down you are more than welcome to bring your own picnic. 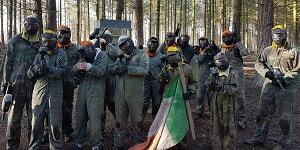 To check availability for a paintball venue or for any more info please don't hesitate to contact us. You can give our main booking office a call on 07889 666878 or email us at sales@paintballdirect.co.uk if you would like us to call you.